Having been in the deep freeze here in Wisconsin for a month and a half, I found my thoughts drifting back to last August, when we were in Paris and it was hot. I started browsing my photos from that trip. 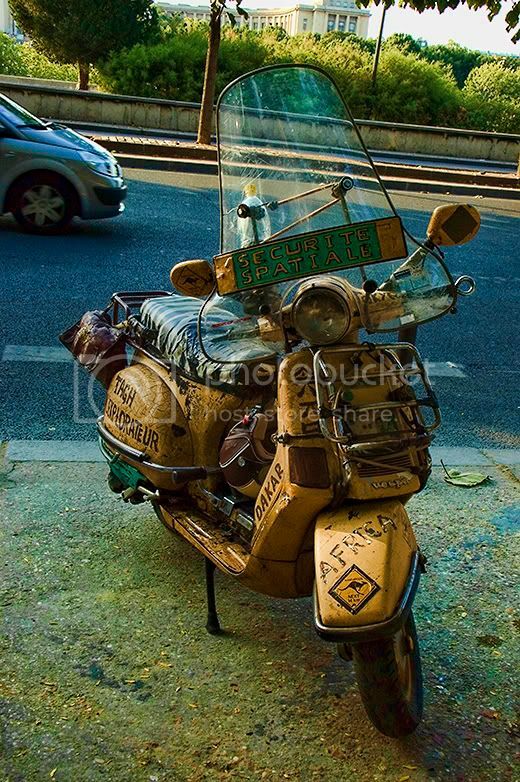 I wish I could have met the owner of this Vespa I saw just a block or so from the Eiffel Tower. And that he/she spoke English. I would love to know if this machine is supposed to be a vehicle for ironic humor, or whether it has actually been on at least four continents. It has that put-on kind of air, but there is no denying this little scooter has rolled up some serious mileage and borne some intense heat. The paint is cracked beautifully, and the zebra-skin patterned vinyl appears to be at least the second skin on the seat. The scratches on the windshield may be the result of bashing through the Australian bush or deflecting howling Darkar sand on the easternmost point in Africa. Since I never met the owner, I am going to choose to believe that this tiny yellow Vespa – as part of the “Securite Spatiale” – Space Security - has actually been to Japan, Australia, Africa and I can personally vouch that it has been to Paris. I wonder where on the planet (and which planet) it’s helping keep the peace on now.